You may remember that a few months back I posted a recipe for Preserved Lemons and Limes. That very citrus has been picklin’ away for about two months now, and I used a some of it for today’s recipe: My version of Chicken Tagine. I had never made chicken tagine before, so I decided to look at a number of recipes and pick and choose the method and ingredients that sounded best to me. Traditionally, chicken tagine is baked in a vessel called a tagine, but I don’t have one. As is the case with the vast majority of life’s culinary conundrums, a dutch oven makes a fine substitute. I kept my tagine spices simple and traditional, and allowed the chicken to marinate in them overnight. 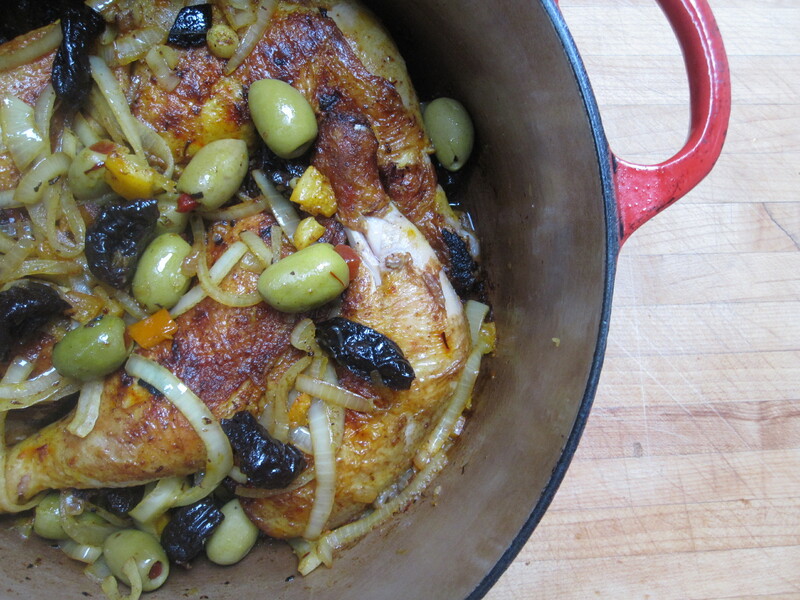 After browning the chicken, I added olives and dried plums. Dried fruit and olives are both common additions to a tagine, and I happen to be particularly fond of these two fruits together. If they sound like a strange pairing to you, all the more reason to try them. If you don’t have any preserved citrus hanging around, see the end of the post for an alternative using fresh citrus. This dish turned out wonderfully and I will definitely be making it again. I think it would make a perfect dinner for company served with roasted squash, steamed rice, or in a more traditional manner, with couscous. 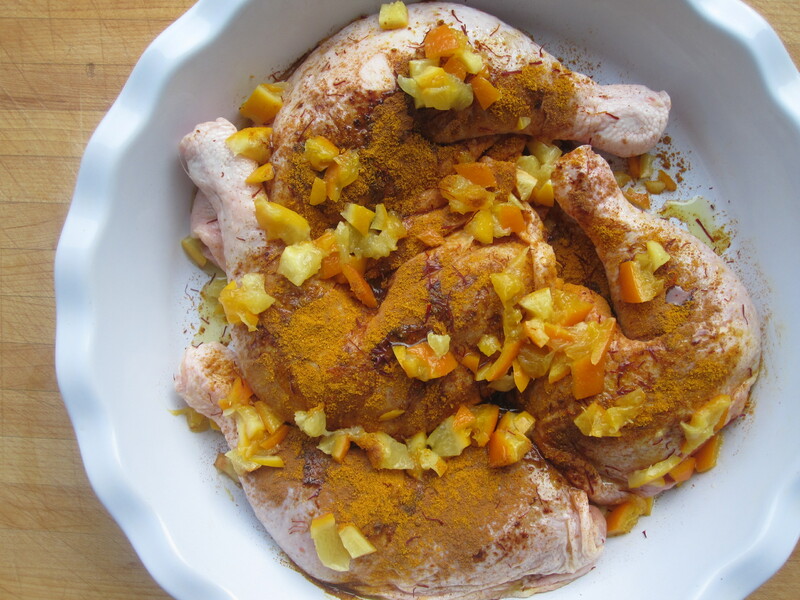 Place the chicken legs into a baking dish in which they will fit tightly in a single layer. In a small bowl, juice 2 Tbsp. of the juice from the preserved citrus. Discard the rest of the juice and pulp from the citrus, saving the peel. Roughly chop the peel into about ½ “ chunks and add it to the bowl along with all of the spices, the olive oil, and salt. Mix the ingredients until combined. Pour the marinade over the chicken and massage it all over the skin and flesh. Cover and refrigerate for at least 4 or up to 24 hours. Pull the marinated chicken from the fridge 30 minutes before you intend to begin the recipe. Preheat the oven to 350 degrees. Heat your dutch oven over medium heat and add the ghee or olive oil. Shake any excess marinade from the chicken and pull off any of the citrus chunks, returning them to the bowl for later. Place the chicken legs, skin side down, into the hot fat and cook, undisturbed, for 4 – 5 minutes or until brown. Turn the legs over and do the same for the second side, then transfer the chicken to a plate (they will not be cooked trough). Into the same pan, add the onion and the citrus chunks from the marinade. Sauté for another 4 – 5 minutes, stirring often, until the onions are quite soft. Return the chicken legs to the pan in a single layer and try to spoon the onions and citrus on top of the chicken as best you can. Scatter the olives and plums around the pan and add the water. Allow the water to come to a simmer, and then cover the pan and transfer to the oven. Bake the tagine for one hour. All of the flavors will come together in a lovely way and the chicken legs will be incredibly tender. *If you don’t have preserved citrus, use 5 or 6 strips of citrus peel and fresh citrus juice for the marinade (I think a little orange and a little lemon would be very nice). Resist the urge to chop the peel finely for the marinade – it will only burn when you brown the chicken. Instead, after the marinating is complete, chop it roughly and add to the pot along with the onions as described in the recipe. Note also that the amount of salt in the marinade increases if using fresh citrus. This entry was posted in gluten free, paleo, perfect health diet, poultry and tagged chicken, gluten free, paleo, perfect health diet, poultry, preserved lemon, tagine. Bookmark the permalink.